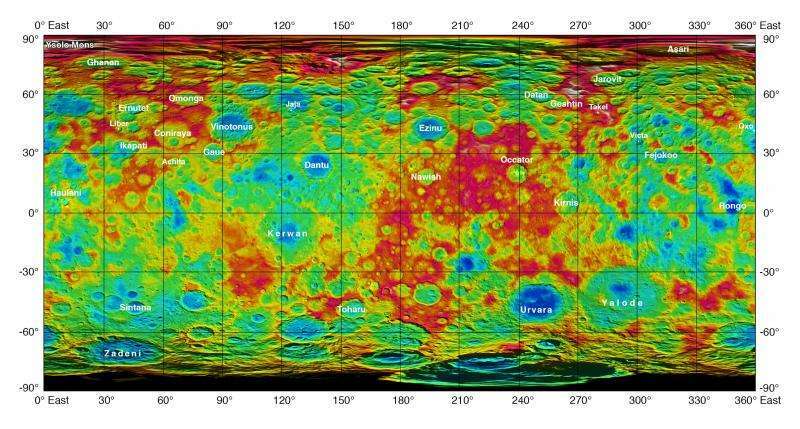 At the European Planetary Science Conference in Nantes, France, NASA presented some spectacular maps and observations about Ceres, the largest object in the asteroid belt, and the largest of the minor planets within the orbit of Neptune. Astronomers analyzed data coming from the Dawn spacecraft, which entered orbit around Ceres on 6 March 2015. 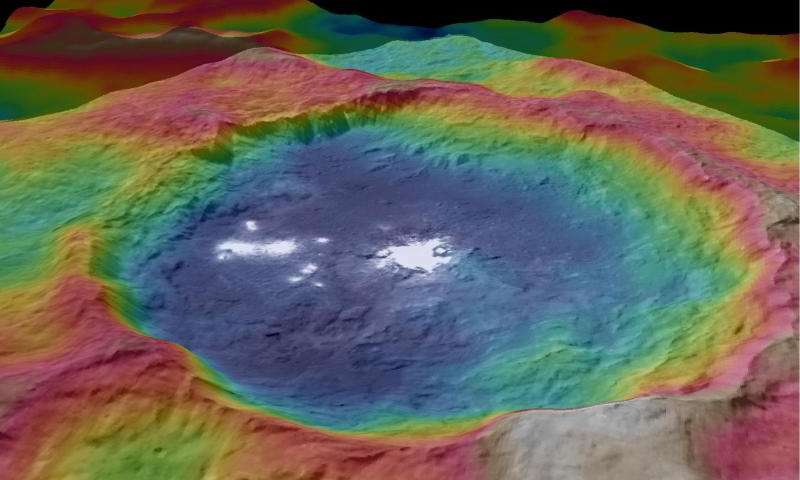 The peculiar shapes of the craters on Ceres are also surprising. “The irregular shapes of craters on Ceres are especially interesting, resembling craters we see on Saturn’s icy moon Rhea,” said Carol Raymond, Dawn’s deputy principal investigator based at NASA’s Jet Propulsion Laboratory, Pasadena, California. “They are very different from the bowl-shaped craters on Vesta.” Vesta is another large planetoid in the area. Another unexpected observation was the data coming from the gamma ray and neutron spectrometer on Dawn. The instrument detected three bursts of energetic electrons – these may result from the interaction between Ceres and the Sun’s radiation, but that’s also not confirmed. Observations made on Ceres suggest that it has a differentiated body, a rocky core overlain with an icy mantle. This 100-kilometer-thick mantle (23%–28% of Ceres by mass) contains up to 200 million cubic kilometers of water, which would be more than the amount of fresh water on Earth. This result is supported by the observations made by the Keck telescope in 2002 and by evolutionary modeling, and Dawn observations are also consistent. Dawn became the firsts mission to ever reach a dwarf planet, arriving at the planetoid on March 6, 2015, after it conducted measurements on March 6, 2015. Currently, Dawn is orbiting Ceres at an altitude of 915 miles (1,470 kilometers); it will conduct several full orbits, each of which will last 11 days.